Director Erika Cohn in-person for a conversation with Lucy Webb and audience Q&A following the screening. 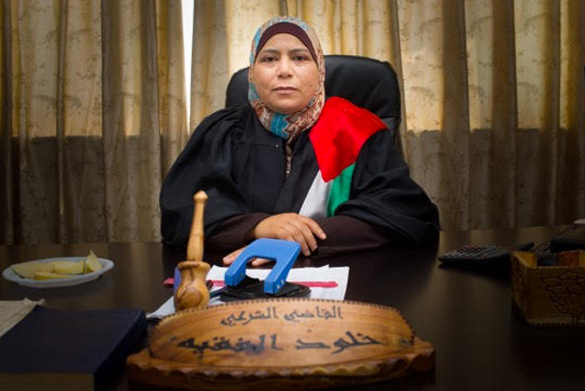 THE JUDGE offers a unique portrait of Judge Kholoud—her brave journey as a lawyer, her tireless fight for justice for women, and her drop-in visits with clients, friends, and family. With unparalleled access to the courts, THE JUDGE presents an unfolding vérité legal drama, with rare insight into both Islamic law and gendered justice. In the process, the film illuminates some of the universal conflicts in the domestic life of Palestine—custody of children, divorce, abuse—while offering an unvarnished look at life for women and Shari’a.